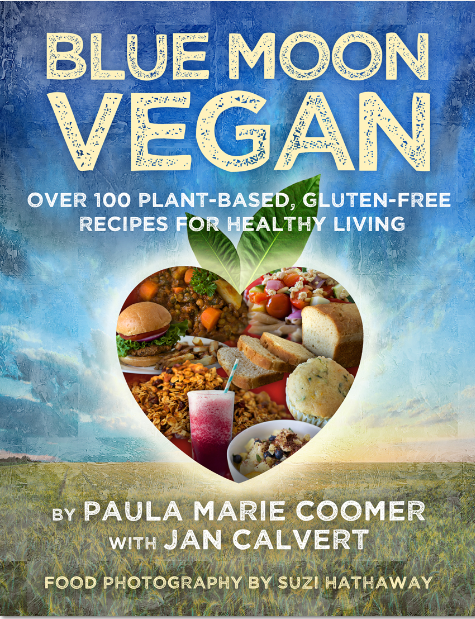 In Blue Moon Vegan, Paula Marie Coomer partners with baker Jan Calvert to raise the culinary bar with over one hundred original recipes, all of which are based on plant-derived ingredients and are also gluten-free. Ranging from luscious side dishes such as “Butter-Dill Salad” and staples like “Paula’s Lasagna al Forno” to scrumptious breads, snacks, pastries, and innovative main courses such as “Squash Blossoms in Cashew Cream,” these easy-to-follow recipes will inspire both new and experienced vegans as well as omnivores looking to add a few meatless meals to the menu. The book also includes dozens of pages of nutrition and cooking information, based on Coomer’s background in nursing, Calvert’s experience running her own gluten-free bakery, and their mutual struggle with gluten intolerance. Beautifully photographed and formatted for easy use, Blue Moon Vegan is destined to become a well-used favorite for cooks of all persuasions and represents another step along the path to healthy eating which began with Coomer’s food memoir, Blue Moon Vegetarian. Praise for Blue Moon Vegan click here.